• Dear David, By far, one of the brightest spots in this wonderful election year was your winning in the Wilmington district. I never thought I’d see a Democrat win, and you did it in style. • Dear David, I’m sorry to hear that you are leaving the Legislature - but you can stand proud of all you have accomplished. Beginning with the 1950s, author Dave Larsen describes his youthful perspectives on communism and presidential politics. He then moves to the issues of the Sixties that most directly affected him, including the Vietnam War, student protests, the military draft, and the military itself. He writes about accepting a teaching job in a small Vermont town, living there, and becoming increasingly involved in civic activities and the local political scene. During this time he learns about local issues and the challenges and opportunities of small town politics. Eventually, Larsen runs for and is elected to the Vermont House of Representatives where he deals with legislation and issues ranging from the naming of the state reptile to high school athletics to gender equity, solid waste, discrimination based on sexual orientation, education, property tax reform, and the state’s annual budget. He describes his campaigns and lawmaking experiences with everyone from governors to fellow lawmakers to constituents, all while using pseudonyms (excluding constitutional officers) to respect the privacy of those involved. With detail and clarity he recounts his successes and failures, his small victories and minor blunders, and from all of them, lessons learned. Small Town Rep. is based on Larsen’s personal journals, scrapbooks, letters, government publications, mass media, and an array of other documentation. He offers a balanced analysis of the Vermont issues of the 1980s and 1990s. 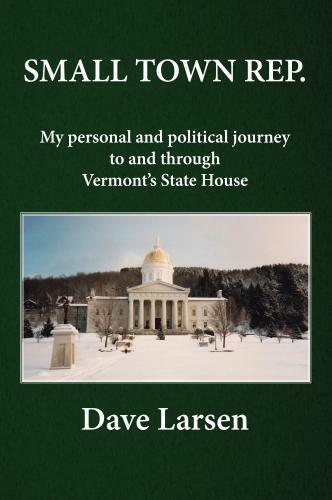 But he also includes many anecdotes, some humorous, some poignant, that illustrate Vermont’s small town life and State House politics. Whether you’re a political enthusiast or a political novice, a longtime Vermonter or a non-Vermonter who’s interested in politics in the Green Mountain State, Small Town Rep. will both inform and entertain. Dave Larsen grew up in Rochester, NY and, along with his wife, Kathy, graduated from the University of Vermont. They moved to Wilmington, VT where they worked as teachers and raised their son. Larsen taught at Wilmington Middle/High School from 1972-2005. During that time he also served in the Vermont House of Representatives and in various other state-level capacities.